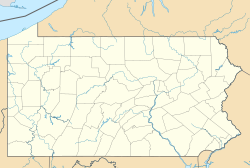 The Priesthood Restoration Site, formally known as the Aaronic Priesthood Restoration Site, is a historic site located in Oakland Township, Susquehanna County, Pennsylvania, United States. Because of its historical significance to Mormonism, the site is owned and operated by The Church of Jesus Christ of Latter-day Saints (LDS Church). The site comprises property once owned, and lived on, by Joseph Smith and is the spot where Latter Day Saints believe the resurrected John the Baptist conferred the Aaronic priesthood upon Smith and Oliver Cowdery in 1829. In September 2015 the Church dedicated the site, which includes a visitors' center and meetinghouse, monuments, and the reconstructed homes of Joseph Smith and the Hale family. In December 1827, Smith and his wife, Emma, moved to the area, hoping to escape persecution experienced in Palmyra, New York. After arriving the Smiths purchased 13.5 acres (5.5 ha) from Emma's father, Issac Hale. In Smith's day, the property was located in the Harmony Township of Susquehanna County; when the Oakland Township was incorporated in 1853, it included the land in question. Emma had been raised in Harmony, and many of her family members lived in the area. Her brother, Jesse Hale, had constructed a three-room frame home which the Smiths purchased and had moved onto their property. While living in the home the Smith's first child, Alvin, was born and died. Alvin is buried just east of the historic site in the McKune Cemetery. According to Mormon histories, a large portion of the Book of Mormon was translated by Smith while living in the home. According to Smith, the Aaronic priesthood was restored to him and Oliver Cowdery on May 15, 1829, somewhere in the woods near the home. After being given the priesthood by John the Baptist by the laying on of hands, the two men baptized each other in the nearby Susquehanna River. Following the baptisms, they ordained each other to the Aaronic priesthood. The Smith family left the area and their home, moving to Fayette, New York, in August 1830. In 1919, the home lived in by the Smiths was destroyed by fire. Because of the site's significance to its early history, the LDS Church purchased the original site and some surrounding property. Between 1947 and 1959, the church purchased the original property and six additional acres. In 1960, a monument was added to the site which commemorates the restoration of the priesthood. The monument includes a sculpture by artist Avard T. Fairbanks, depicting John the Baptist conferring the priesthood on Smith and Cowdery. In 2002 the Church purchased 25 acres of land which had been heavily polluted by adjacent railroad activity. This purchase extended the Church's holdings to the river. Since that time additional property has been purchased, expanding the church's holdings in the area to 157 acres (64 ha). The most recent acquisition occurred in January 2011, which added 10 acres (4.0 ha) purchased from the Boughton family for $2.1 million. In a letter dated April 15, 2011, the LDS Church announced to nearby members that the site would be restored. The restoration includes reconstructing the homes lived in by the Smith and Hale families, along with farm out-buildings. A combination visitors' center and meetinghouse is constructed, along with a new monument. Pennsylvania Route 171, which splits the historic site in two was rerouted as part of the project. In August 2015, the church announced that with construction completed, the site opened to the public on August 29 and was dedicated by Russell M. Nelson on September 19, 2015. ^ a b c LDS Church (2013). "Priesthood Restoration Site, Harmony (now Oakland)". Joseph Smith website. Retrieved 18 February 2015. ^ a b c Porter, Larry C. (2001). "Joseph Smith's Susquehanna Years". Ensign. LDS Church (February 2001): 42–51. Retrieved 10 March 2011. ^ "Dedication Set June 18 For Aaronic Priesthood Monument". Church News. Salt Lake City, Utah. 14 May 1960. Retrieved 9 April 2016. ^ "Mormons working to develop another historic site to faith". Gettysburg Times. Gettysburg, Pennsylvania. 23 August 2002. Retrieved 9 April 2016. ^ Robert L. Baker (8 January 2011). "Latter-day Saints make $2.1M land purchase". The Scranton Times Tribune. Retrieved 10 March 2011. ^ "Church to Restore Historic Site in Pennsylvania" (Press release). LDS Church. 21 April 2011. Archived from the original on 24 April 2011. Retrieved 3 April 2012. ^ "Harmony historic site to be memorialized as plans take shape". Church News. 21 May 2011. Retrieved 28 May 2011. ^ Lloyd, R. Scott (2 October 2014). "Church offers preview of priesthood restoration site and film project at Motion Picture Studio". Deseret News. ^ Christensen, Megan Marsden (20 August 2015). "LDS Church to reopen, dedicate site where priesthood was restored". KSL.com. This page was last edited on 24 November 2018, at 14:47 (UTC).